CAUTION: Caution: Serverless is currently in alpha. Run serverless workloads on Kubernetes using Knative. Eventing: Management and delivery of events. Serving: Request-driven compute that can scale to zero. For more information on Knative, visit the Knative docs repo. With GitLab serverless, you can deploy both functions-as-a-service (FaaS) and serverless applications. If you are planning on deploying functions, clone the functions example project to get started. If you are planning on deploying a serverless application, clone the sample Knative Ruby App to get started. Kubernetes Cluster: An RBAC-enabled Kubernetes cluster is required to deploy Knative. The simplest way to get started is to add a cluster using GitLab's GKE integration. The set of minimum recommended cluster specifications to run Knative is 3 nodes, 6 vCPUs, and 22.50 GB memory. Helm Tiller: Helm is a package manager for Kubernetes and is required to install Knative. GitLab Runner: A runner is required to run the CI jobs that will deploy serverless applications or functions onto your cluster. You can install the GitLab Runner onto the existing Kubernetes cluster. See Installing Applications for more information. Domain Name: Knative will provide its own load balancer using Istio. It will provide an external IP address or hostname for all the applications served by Knative. You will be prompted to enter a wildcard domain where your applications will be served. Configure your DNS server to use the external IP address or hostname for that domain. .gitlab-ci.yml: GitLab uses Kaniko to build the application and the TriggerMesh CLI to simplify the deployment of knative services and functions. 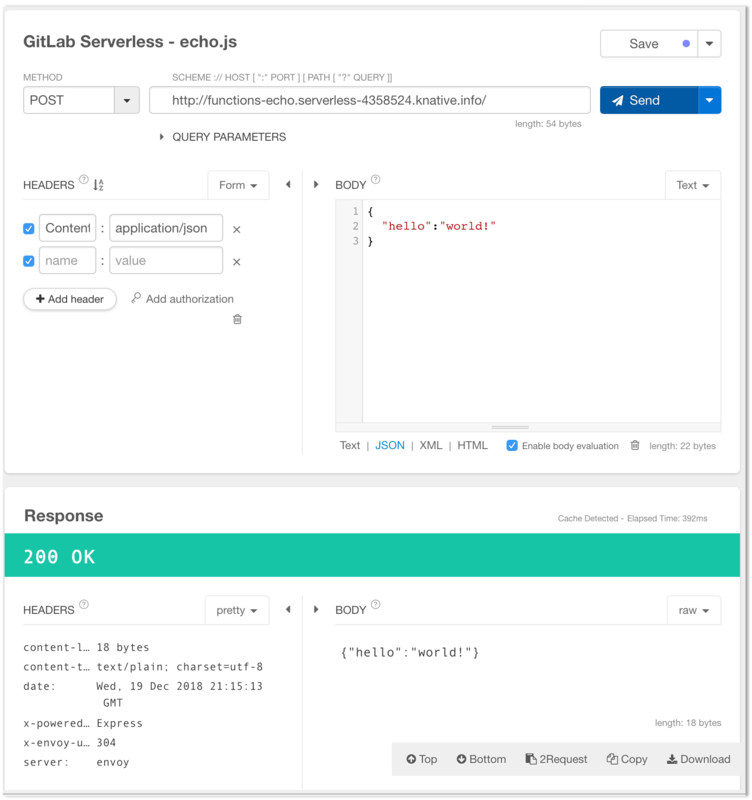 serverless.yml (for functions only): When using serverless to deploy functions, the serverless.yml file will contain the information for all the functions being hosted in the repository as well as a reference to the runtime being used. Dockerfile (for applications only: Knative requires a Dockerfile in order to build your application. It should be included at the root of your project's repo and expose port 8080. Prometheus (optional): Installing Prometheus allows you to monitor the scale and traffic of your serverless function/application. See Installing Applications for more information. NOTE: Note: The minimum recommended cluster size to run Knative is 3-nodes, 6 vCPUs, and 22.50 GB memory. RBAC must be enabled. Add a Kubernetes cluster and install Helm. Once Helm has been successfully installed, scroll down to the Knative app section. Enter the domain to be used with your application/functions (e.g. example.com) and click Install. After the Knative installation has finished, you can wait for the IP address or hostname to be displayed in the Knative Endpoint field or retrieve the Istio Ingress Endpoint manually. NOTE: Note: Running kubectl commands on your cluster requires setting up access to the cluster first. For clusters created on GKE, see GKE Cluster Access, for other platforms Install kubectl. The ingress is now available at this address and will route incoming requests to the proper service based on the DNS name in the request. To support this, a wildcard DNS A record should be created for the desired domain name. For example, if your Knative base domain is knative.info then you need to create an A record or CNAME record with domain *.knative.info pointing the ip address or hostname of the ingress. NOTE: Note: You can deploy either functions or serverless applications on a given project but not both. The current implementation makes use of a serverless.yml file to signal a FaaS project. Using functions is useful for dealing with independent events without needing to maintain a complex unified infrastructure. This allows you to focus on a single task that can be executed/scaled automatically and independently. You can find and import all the files referenced in this doc in the functions example project. Create a directory that will house the function. In this example we will create a directory called echo at the root of the project. Public, continue to the next step. Private, you will need to create a GitLab deploy token with gitlab-deploy-token as the name and the read_registry scope. This .gitlab-ci.yml creates a functions job that invokes some predefined commands to deploy your functions to your cluster. Serverless.gitlab-ci.yml is a template that allows customization. You can either import it with include parameter and use extends to customize your jobs, or you can inline the entire template by choosing it from Apply a template dropdown when editing the .gitlab-ci.yml file through the user interface. serverless.yml: this file contains the metadata for your functions, such as name, runtime, and environment. It must be included at the root of your repository. The following is a sample echo function which shows the required structure for the file. You can find the relevant files for this project in the functions example project. description: "Deploying functions from GitLab using Knative"
description: "echo function using node.js runtime"
service Name for the Knative service which will serve the function. description A short description of the service. name Indicates which provider is used to execute the serverless.yml file. In this case, the TriggerMesh tm CLI. environment Includes the environment variables to be passed as part of function execution for all functions in the file, where FOO is the variable name and BAR are he variable contents. You may replace this with you own variables. In the serverless.yml example above, the function name is echo and the subsequent lines contain the function attributes. handler The function's file name. In the example above, both the function name and the handler are the same. runtime The runtime to be used to execute the function. description A short description of the function. buildargs Pointer to the function file in the repo. In the sample the function is located in the echo directory. environment Sets an environment variable for the specific function only. After the gitlab-ci.yml template has been added and the serverless.yml file has been created, pushing a commit to your project will result in a CI pipeline being executed which will deploy each function as a Knative service. Once the deploy stage has finished, additional details for the function will appear under Operations > Serverless. This page contains all functions available for the project, the description for accessing the function, and, if available, the function's runtime information. The details are derived from the Knative installation inside each of the project's Kubernetes cluster. Click on each function to obtain detailed scale and invocation data. NOTE: Note: You can reference and import the sample Knative Ruby App to get started. With all the pieces in place, the next time a CI pipeline runs, the Knative application will be deployed. Navigate to CI/CD > Pipelines and click the most recent pipeline. Go to the CI/CD > Pipelines and click on the pipeline that deployed your app. Once all the stages of the pipeline finish, click the deploy stage. The second to last line, labeled Service domain contains the URL for the deployment. Copy and paste the domain into your browser to see the app live.